As students go away for college, some are empowered to begin a new personal relationship with their spirituality through the Universal Life Church. Students at Brown University are beginning to discover what the church can do for them. For Curry-Broadbent, his ordination has also provided him with a more personal sense of spiritual identity. Each new minister can cite a reason for their ordination, with influences ranging from spiritual betterment to simply performing a marriage. 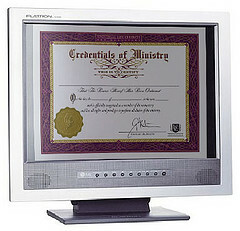 All individuals are welcome to get ordained. Under Brown University’s section of the college party culture blog, College on the Road, the assertion is made that these online ordinations are less than legitimate. The best part? ULC doesn’t discriminate based on one’s religion. So, your Jewish/Muslim/Buddhist friends can all get in on the sacrilegious action. While our ordinations may be sacrilegious in the eyes of some, it is comforting to know that the author of this article is in a position to continue their education. We suggest a class in comparative religion. There is a long history of judicial disputes involving the Universal Life Church, and records show that our work as freedom fighters continues today.